The perfect pair of ripped skinny jeans are here! We love this high waisted fit, perfect for pairing up with crop tops and bodysuits! Filter By Height: Show All 5'1" 5'4" 5'7" 5'9"
I love these jeans! They are extremely comfy and fit well. Only negative is that the ankles are a little wide and not very tight fitting so would recommend to roll up slightly or wear tucked into boots. Was really excited about these pair of jeans, however, they were a small fit with a very poor zipper. 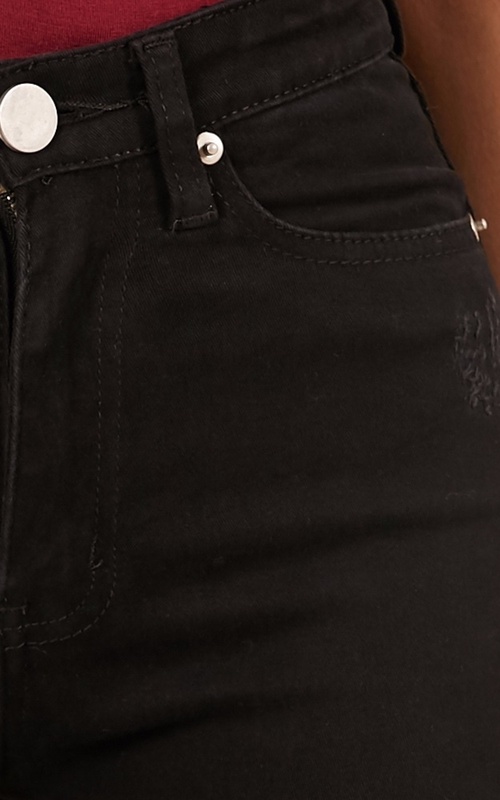 The only black rip jeans I've ever owned. I love the fit of it and the colour. I'm not very tall. With normal flat shoes, I'm around 162-3cm.. So it's always hard to find one that's not too long but also fits my hips and waist. This fits perfectly so thank you. The only thing is if you don't manage it well, the rips would tear alot. Don't mind huge amount of rips but sometimes would prefer lesser. Overall, love it.